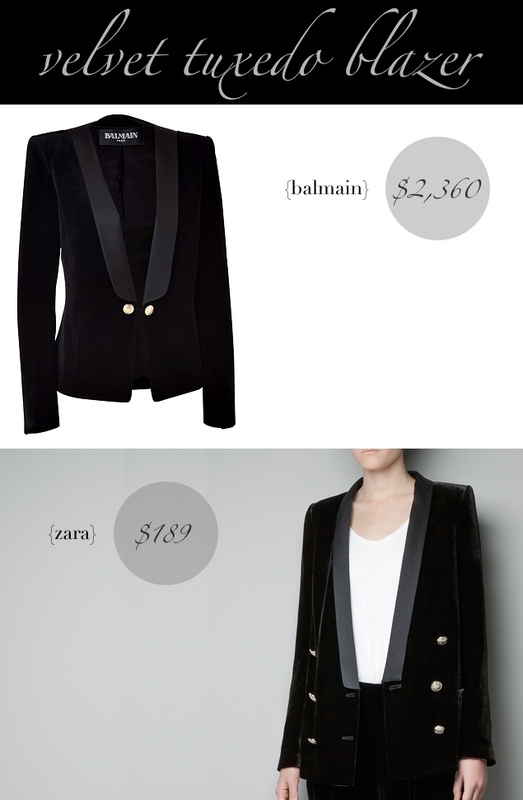 the balmain tuxedo blazer is dreamy! everything from the velvet to the satin on the lapel...even the gold buttons is pure perfection! with that kind of price tag it sure better be, right?! it would be nice to own ANYTHING balmain, but it's a brand i will never be able to cross off from my wishlist. i did find an alternative from zara that's a m-a-j-o-r steal! i know the velvet, satin and gold button may not look as dreamy, but it looks pretty darn close, doesn't it? I'm crazy about Tuxedo blazers. I own a grey/black jacket from Rag & Bone and it's fabulous but I'd love to own one in black. I saw this blazer on Zara's site the other day too, though I have to say the splurge version steals my heart! It was so nice to meet you and Emily at the Lookbook.nu Holiday Party last night! Awesome blazer:) I love it!